Click on images below for more examples. 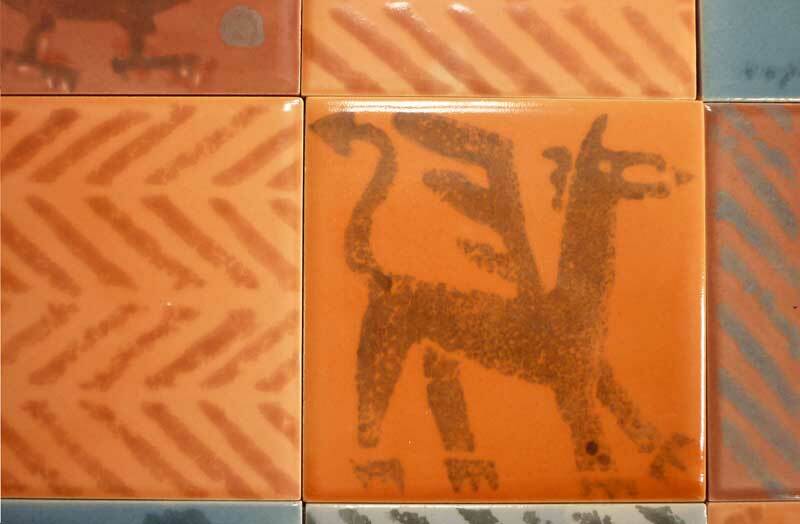 Cuerda Seca- Cuerda seca - An old Moorish / Arab technique which is a ceramic version of batik in which hot wax and manganese dioxide are drawn directly onto the unglazed tiles to produce bold and energetic outlines. 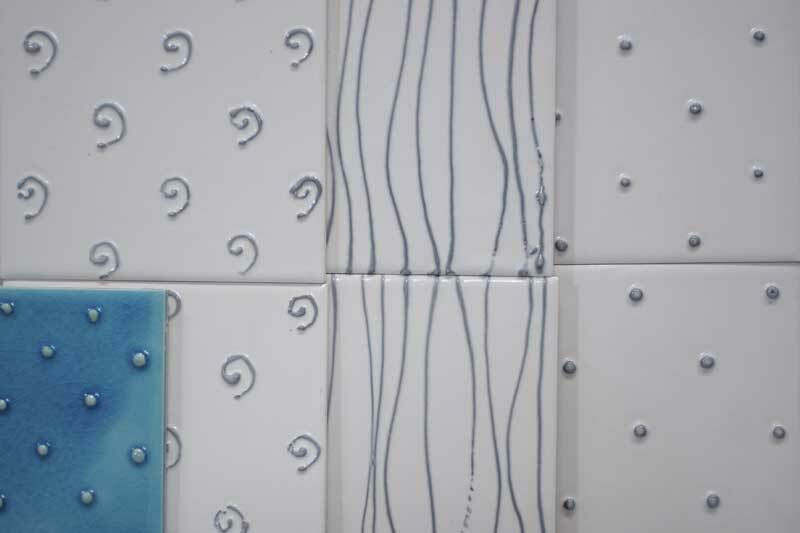 Tube Lining- A clay slip designed to stick to bisque tiles is piped [like cake icing] onto unglazed tiles to produce outlines, or compartments; these tiles are then fired. Next glazes are applied to this surface, using the compartments and the tiles fired a second time to complete the process. 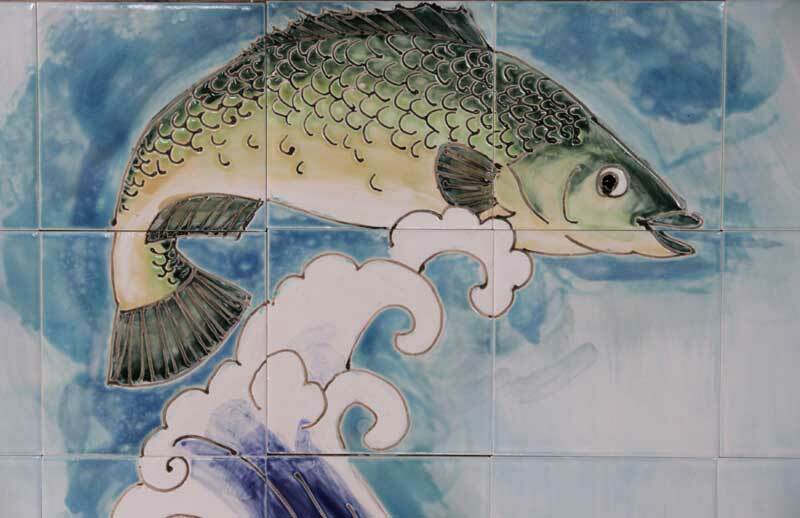 Tin Glaze- Also known as 'delft', or majolica, the liquid glaze has an opacifier e.g. tin oxide, added to an otherwise transparent glaze to make it white and opaque (other materials can be added to produce various off white tints). This glaze is poured over the tiles and allowed to dry. 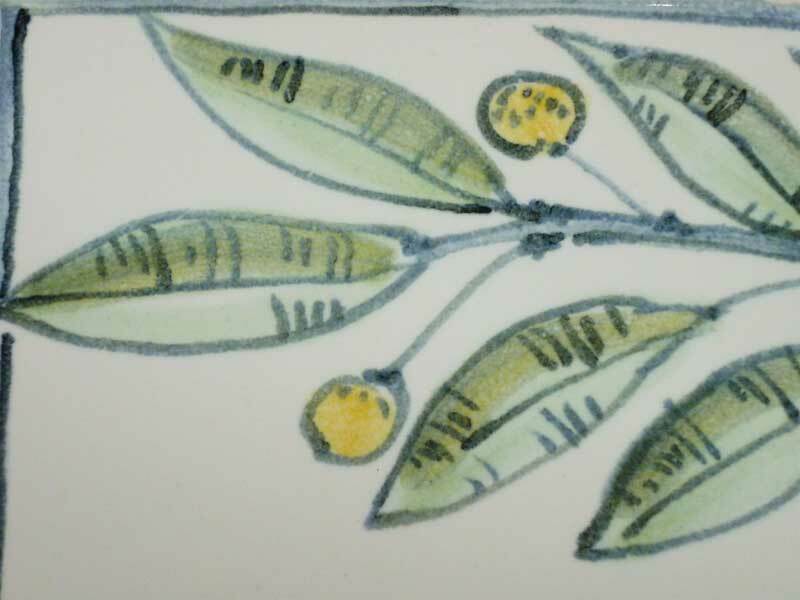 Sponge Print- This technique uses the same glaze and oxides, or stains as tin glaze but here the colour is applied using specially cut sponges to print directly onto the unfired glaze surface. Plain Tiles- Tiles can be glazed with translucent, or opaque glazes. Some colours can only be made using particular recipes; for example alkali crackle glazes produce spectacular turquoises and rich blues. 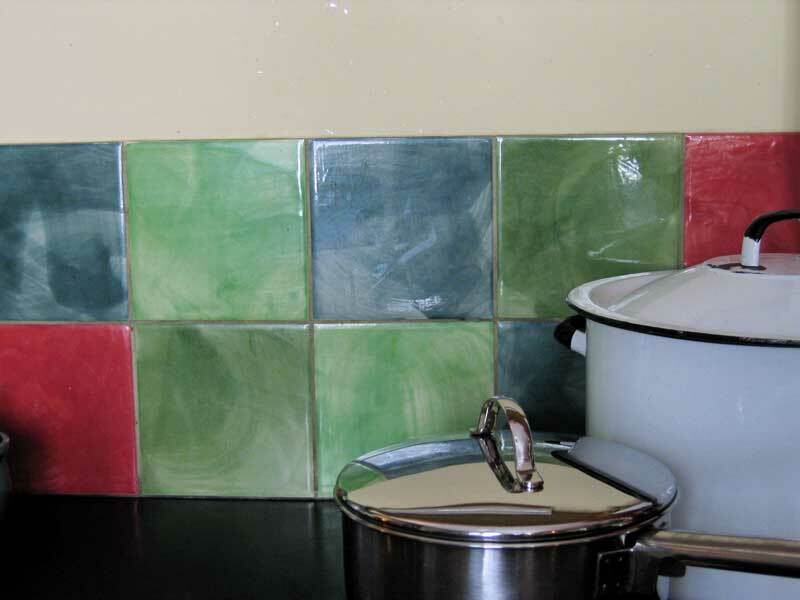 Hand Made Clay Tiles- Made in a variety of naturally coloured clays and sizes. 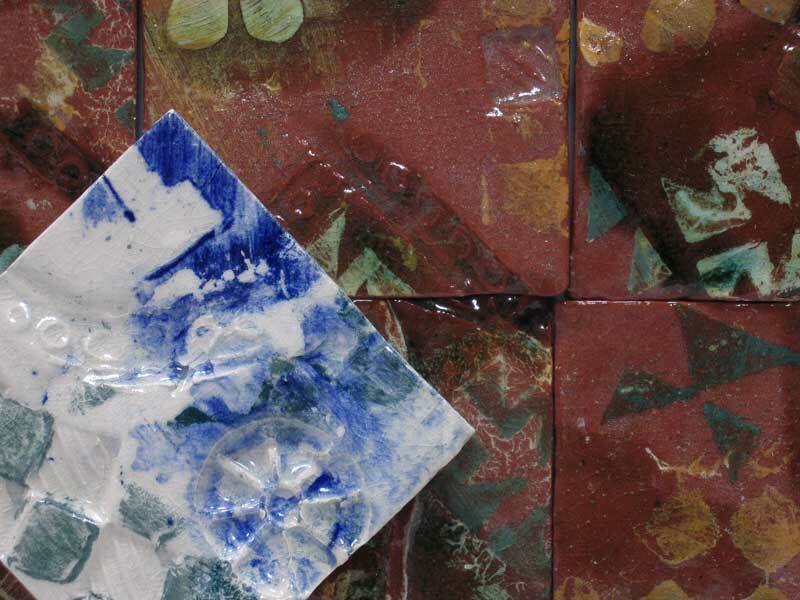 Handmade tiles can be decorated using roulettes and plaster stamps, or sponges with coloured clay slips and stencils in a random way, to produce a range of pattern, textures and colours. 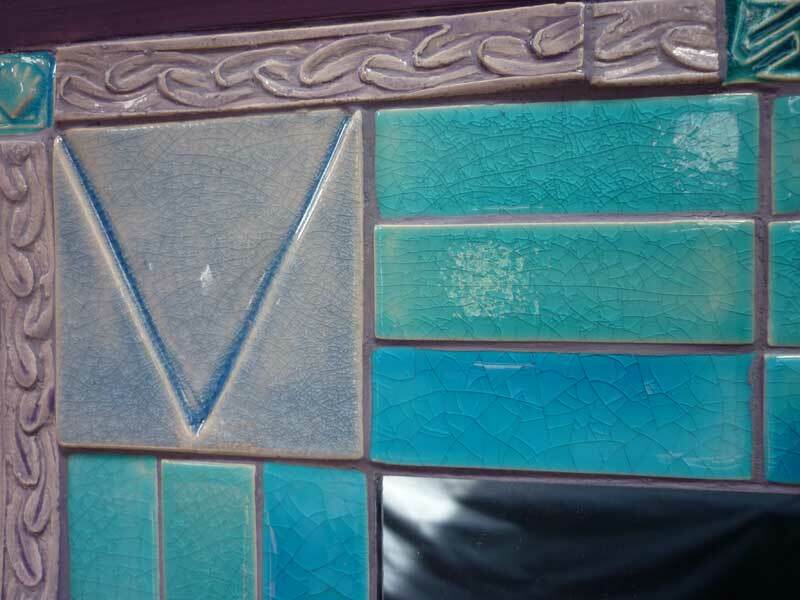 Tile Mosaic- These panels are constructed from a combination of handmade clay tiles, rouletted clay borders with small detail stamped mosaic tile and standard tiles.